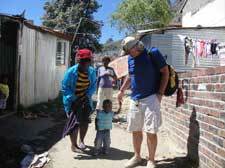 For Valentines day, surprise your loved ones with planning a trip to South Africa that will change your life and the lives of those for whom you will volunteer. 20 years after apartheid ended, South Africa has deep hope, awe-inducing, gorgeous tourist sites, yet its society is still one of the most unequal in the world. Over 19 million children bear the brunt of the resulting poverty, very often with no running water or flushing toilets. Come be a part of the change. The program is 100% tax deductible: $1390 for one week, Saturday to Saturday programs. Includes food, accommodation, bottled water, 24/7 bilingual coordinator, in-country transportation, project materials, medical insurance, etc. Q: What are some of the volunteer opportunities? Q: What will the accommodations be? A: It depends on which project site has the biggest needs. Furnished modern apartments in Hout Bay or Cape Town. The former is situated within a mile of Imizano Yetho program site. 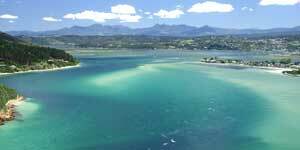 Within walking distance of supermarkets, cafes, and the ocean. The latter apartment in the central Cape Town suburb of the “Gardens”, close to the Mount Nelson Hotel. Transport provided to program site. 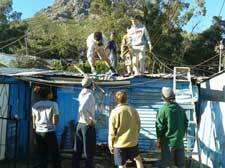 If the group is large enough, we will accommodate them in dormitory style housing in central Cape Town. Hot running water, flushing toilets and access to electricity is provided. Q: What about our leisure opportunities? 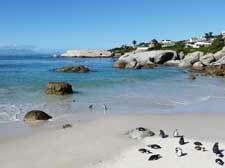 A: South Africa is known for its diversity and splendors. Several planned but optional cultural activities are included, such as exploring the colorful Bo-Kapp neighborhood, but there are also many optional sites you can explore in your free time. Your coordinator can help you to organize. Animals: Ostriches, baboons, excursions to refuges with all the famous Big Game animals. Start saving now for spring and summer travels! It never hurts to plan ahead!